Not very good, but also not terrible, this movie captures the dark atmosphere nicely, but has lousy effects and some pretty dopey ideas that come in towards the end. This is a movie that works in its first half and then falls apart in its second half. The film is never completely terrible, but boy does it have some major missteps. Mainly in the ways of The Human Torch and Doctor Doom. Both characters are handled poorly, look terrible, and don’t add anything of value to the picture. Doom, in particular, is an annoying villain, who single-handedly ruins the ending and leads to a lousy climax. But before that, the movie was actually not bad. The first couple of acts, which establish who these characters are and why they are trying to build something that can change history, are pretty interesting. It’s once they get into the machine and take off that the movie starts going downhill. Ironically, you would think that would be where the movie got good. After all, everything proceeding this was the human story, and everything after it was the superhero story. Still, from the dopey look of planet zero to the way that Sue Storm isn’t even with them on the mission, yet still gets powers, the movie suddenly starts making one mistake after another. There was definitely potential here, including a cool, dark approach to telling the story, but by the end of the movie, there was very little left to like. 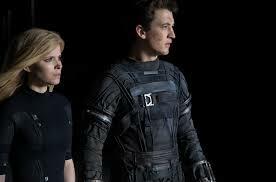 First of all, let’s just get this out there… The Josh Trank directed Fantastic Four is far better than the two Tim Story films from the 2000s. Those movies, featuring Jessica Alba and Chris Evans went for campy and corny and colorful so often that you felt like it was just a slight step up from Batman and Robin. At least this new version is dark and ambitious. It tries to be realistic, which is kind of crazy, when you think about the characters and situation, but it definitely deserves credit for trying. Everything before the characters get their powers is pretty good. That means basically the first half of the film. Some will be hard on the movie, saying it takes too long for the action to get started and that the first half moves too slowly. Considering how poorly this film handled the action, and how much better the first half was than the second, these sort of complaints about the first half are unfounded and ridiculous. After all, it’s the setup and establishment of these characters and this world that really gets us to care and want to see more. The movie is divided into five acts, some of which are longer than others. First, we start off with Reed Richards and Ben Grim as kids. That’s act one. Act two is about Richards going off to study at the Baxter Institute and creating a transfer of matter machine. Act three is about going off to the planet, known as planet zero. Act four is about our team members returning home and experiencing their powers. Finally, act five is about Doctor Doom and the climactic showdown. Now act five is pretty terrible. And it’s unfortunate that this was the final act, because had any of the other acts been the worst, we would not have felt the impact nearly as much. The final act is the one you walk away remembering most, not to mention the climax, and therefore what should have been the most exciting part. In this movie, it was the worst part. One could look at these five acts and say that the movie gets progressively worse, as it goes on. It certainly starts out pretty good and then gets lousy as it goes on. In that first act, Reed and Ben establish a friendship when they meet in the junkyard that Ben’s family owns. Ben helps Reed find a part, Reed shows Ben what he’s working on in his garage, and the rest is history. I like the way the movie shows us that Ben comes from an abusive family, and the way the line, “it’s clobbering time,” first comes up. Most of the transitions between acts involve a black screen and the title card, “one year later,” appearing. In between the first and second act, it is actually a number of years difference, and our heroes find themselves in high school when we join back with them. Reed and Ben are at a school science fair presenting their project. They get disqualified for presenting something that seems like magic more than science, and shattering the basketball backboard. They also get the attention of Doctor Franklin Storm who runs the Baxter Institute of Science and offers Reed a scholarship. Now there are things to like about this and things to dislike. I appreciate the way the movie took the time to explain the experiment and how Reed thinks he is just sending matter to another place on earth, when in actuality he’s sending it to another world. I don’t know what Ben is doing presenting the project with Reed, considering Ben appears to have no connection to science whatsoever. Sure, the two of them are friends, but is that really enough to make Ben a partner here? Luckily the movie doesn’t go too far with this, and only Reed gets the scholarship, not Ben. The next act is all about working at the Baxter Institute. 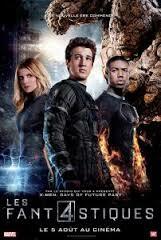 This is where we meet Johnny Storm (Michael B. Jordan) and Victor (Toby Kebbell.) I like that Victor isn’t made to be too evil or brooding. Sure there are hints of it here and there, like the way that he doesn’t get along with some of the other team members, but he’s not such an obvious manifestation of evil that he seems like a cliche. There was one moment which felt out of place, when Reed and Sue Storm (Kate Mara), were sharing a joke and Victor called Reed outside for a talk to tell him he was being unprofessional. Other than that, however, the act pretty much works. I like how Johnny is introduced as being not a scientist, much like Ben Grimm isn’t either. In Johnny’s case, he’s a hothead rebel who drag races and gets himself arrested. I also like the way this movie explains why the characters would jump in the machine without anyone knowing. There is talk about how the executives who funded the project now want to hand it over to NASA and how these young kids don’t want someone else to get all of their glory. They discuss Neil Armstrong and Buzz Aldrin, and how nobody knows the names of the people who actually built the rocket ship they took to the moon. These guys don’t want to find themselves in that same situation. So they hop into the machine and launch into space. Kind of. It actually brings them to another world in another dimension. What doesn’t quite work here is that Sue doesn’t join them. Now I understand that she is the moral one of the bunch, and that her character would not have gone along with this, but you can’t tell me she stayed behind in the lab and yet still got powers. It doesn’t make any sense. She should have gone with them just to try to stop her brother, Johnny, yelling at him that he’s not a scientist and that if he’s gonna go and then someone has to be there to keep an eye on him. Something like that. Now the planet itself that they go to is pretty lousy. This is about the halfway point of the film, and it’s where the movie starts to take a dive. Just when we are getting to the effects and things we have been waiting for. The planet is dark and filled with cracks. There’s a green liquid inside of the cracks. They follow it to giant green pools. It all looks pretty dumb. My understanding is that the reason why it was green was so the filmmakers could splash Victor with it and eventually make him covered in green cracks, so that he at least shared the same color as his comic book character. How about you give him a green cape, like the comics did, and call it a day? Then they could have made the liquid red, like lava, and suddenly we would have something that we could consider semi-realistic. What’s pretty cool is the way that the movie explains why they each got different powers. With Ben Grimm, he can’t get his passenger door shut, and rocks fly into his pod. With Johnny Storm, fire blasts through the window of his and scorches him. With Victor, he gets covered in that green liquid and left on the planet. With the other two, the explanations aren’t very cleary or well-thought out at all. Apparently Reed’s arm stretched a little when he was trying to help Victor. Give me a break. And Sue Storm turning invisible… I have no idea. Something about when the machine came back to earth there was somewhat of an explosion wave and it washed right over her. This is pretty dumb. Now comes the act where the characters discover their powers. Considering Reed’s stretchy situation, where it’s gotta be just about impossible to make look cool, I think this movie did a fine job. And Ben Grimm as the thing looks great. Even the Invisible Woman, Sue Storm, I’ve got no problems with. But Johnny Blaze turning into the human torch doesn’t work. That’s mainly because of his face. He becomes like a cartoon character where you no longer see a human face of any kind. I understand they needed to cover his face, just like Tony Stark covers his face with an Iron Man mask, but they should have found a way to make it look believable, and not like it was completely animated. If Johnny Storm is bad, than Dr. Doom is worse. This is the most awful rendering of Doctor Doom imaginable. His mouth doesn’t move, and it doesn’t even seem like the man underneath the costume is actually talking. The movie doesn’t give us any explanation about his outfit or body state and how it got to be this way, and for most of his screen time, he doesn’t even wear the green robe and hood. He’s just a metal skeleton walking around, with green cracks inside of him. Even his eyeballs are bright green. To make matters worse, his motivation is dopey, and it leads to a terrible final act. Our characters go after him, back to planet zero, because something he’s doing over there is causing destruction on earth. How about Doctor Doom tries to take the machine and kills anyone who tries to stop him, and eventually the kids just let him take it and blast himself to another world, never to be heard from again? Maybe they felt like this would not be climactic enough, and so they brought everyone back to that other planet, but it is such a gloomy and dumb looking place, that it only hurts the film to have them go back there. The movie as a whole is not all that bad, but it certainly loses whatever momentum it had going, by the end.